While the richest sources of complex carbs -- like potatoes and pasta -- are comforting and satisfying, they're also restricted in low-carb diets. You may be able to enjoy a couple small servings of complex carbs on your low-carb diet, but more restrictive diets might ban these foods entirely. There's no one-size-fits-all answer to how many servings of complex carbs you can have each day, though, so consult a registered dietitian for an individual recommendation. Many of your favorite comfort foods provide a significant number of carbohydrates, which can make them tough to fit into a low-carb diet. Serve up 4 ounces of fresh pasta, for example, and you'll take in 70 grams of carbohydrates. 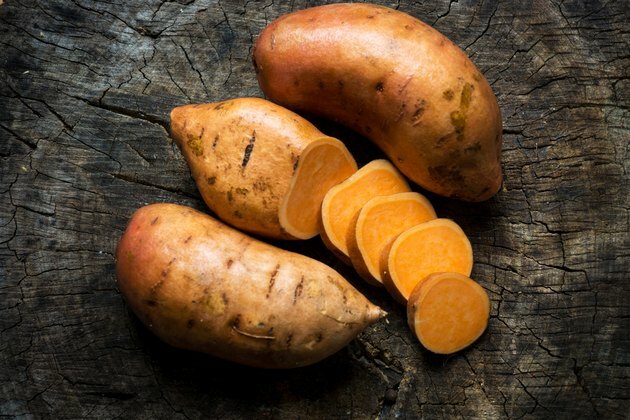 Each medium russet potato supplies 36 grams of net carbs -- the amount of carbs you actually digest -- while a medium sweet potato has 22 grams. A slice of French or sourdough bread contains 35 grams of net carbs, and a serving of fast-food french fries supplies 45 grams of net carbs. If you're on a restrictive low-carb diet, you may be limited to just 20 grams of net carbs per day. That excludes virtually any food rich in complex carbohydrates, as a single serving of any of the previously mentioned foods contains more than your daily limit. Generally, you'll get your 20 grams of carbs from veggies -- like leafy greens, leeks, pickles and asparagus -- plus low-sugar fruits like rhubarb. You aren't allowed potatoes, sweet potatoes or any grains or grain products, like bread. You're also restricted from eating higher-protein sources of carbs, like beans and lentils, since these foods still pack in a significant number of carbohydrates. If you're on a more permissive diet, you may have enough "room" in your carb budget for complex carb-containing foods. If you're allowed 80 grams of carbs each day, for example, a half-slice of French bread and a sweet potato would take up about 40 grams of your daily budget, leaving 40 grams left for vegetables, low-carb fruits and legumes. Exactly how many servings of complex carbs you can eat depends on your diet -- a diet that calls for 50 grams of carbs per day will call for fewer servings of complex carbs than one that calls for 80 or 100 grams. However, you can likely fit in two to four small servings of higher-carb foods daily -- as long as you're accurately measuring your portions, recording your carb intake and leaving at least 12 to 15 grams of carbs in your "budget" for vegetables. Another strategy is to opt for lower-carb alternatives to foods high in complex carbohydrates. Spiral-cut rutabaga, daikon or zucchini work well as alternatives to spaghetti, and so do shirataki noodles, which are low-carb noodles made from konjac yam. Chop turnips or butternut squash into "fries" and roast in the oven for an alternative to french fries, and sauté riced cauliflower in place of actual rice. While these alternatives can't perfectly mimic the satisfying texture of carb-heavy foods, they may still satisfy your craving. And if you need a taste of the real thing, mixing the high-carb food with its low-carb alternative -- for example, 1/2 cup of riced cauliflower mixed with 1/2 cup of rice -- might hit the spot while effectively halving your complex carb serving size. Can You Eat Tomato Soup on a Low-Carb Diet?